Here are some behind the scenes of that gathering. 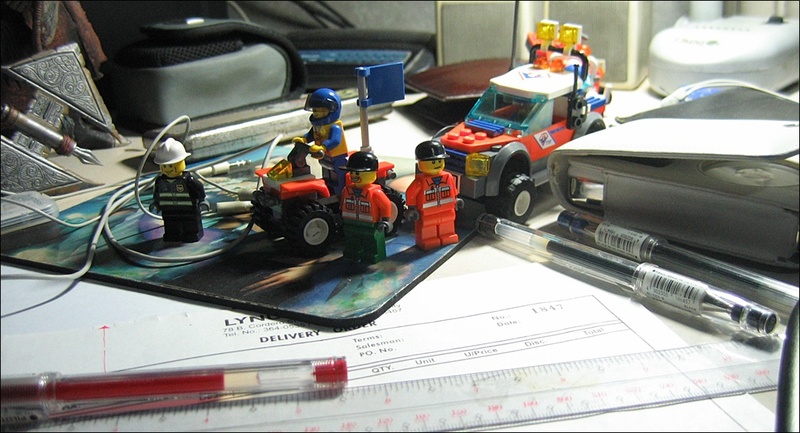 Reiner (center), a LEGO CITY coast guard and his friends, Edward (left) and Belly (right), on their way to the 'attendance photoshoot' last October 03 2008. This photoshoot will also serve as an audition for some possible zenbananas.com work. 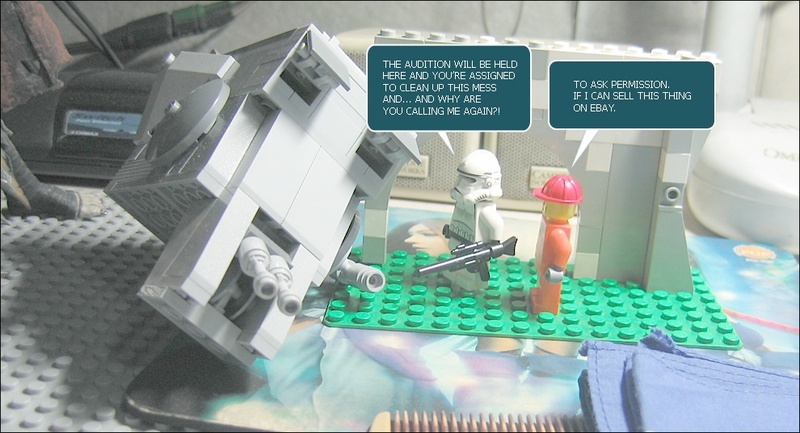 A stormtrooper and a LEGO CITY street cleaner inspects the messy area that will be used for the Attendance Photoshoot. A partially damaged AT-ST (All Terrain Scout Transport) can be seen on site. AT-STs are usually used for reconnaissance and/or defensive vehicles. The damaged AT-ST in this picture was said to be destroyed by an Ewok during the Battle of Endor. Volunteers also help during the clearing operation. LEGO CITY fire, transport, cleaning and coast guard work hand in hand to prepare the grounds for the photoshoot. 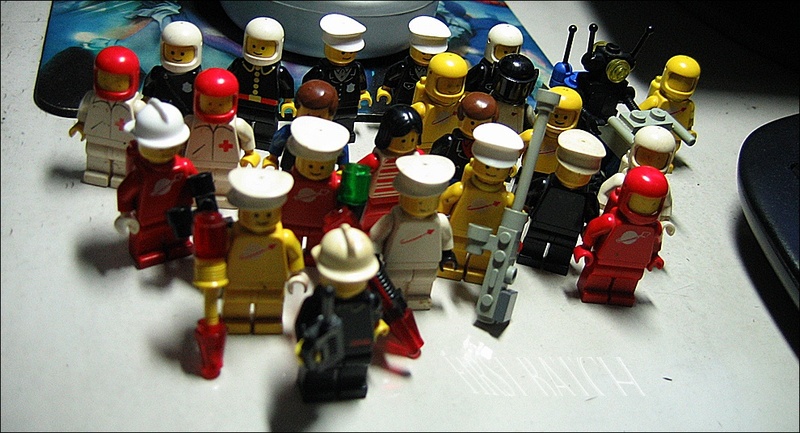 Different LEGO minifigs were also assigned to contact other citizens of the 'LEGO universe'. Here a messenger from the Black Falcons delivers the time and schedule of the photoshoot to a group of soldiers belonging to the Knights of The King's Crown. 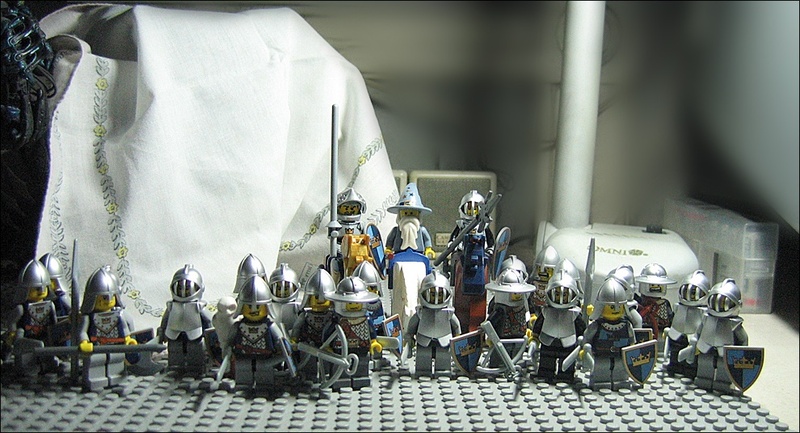 These group of LEGO CASTLE knights are well known for their phobia of flashing lights after a lightning storm struck their camp continuously for three days during their first quest. 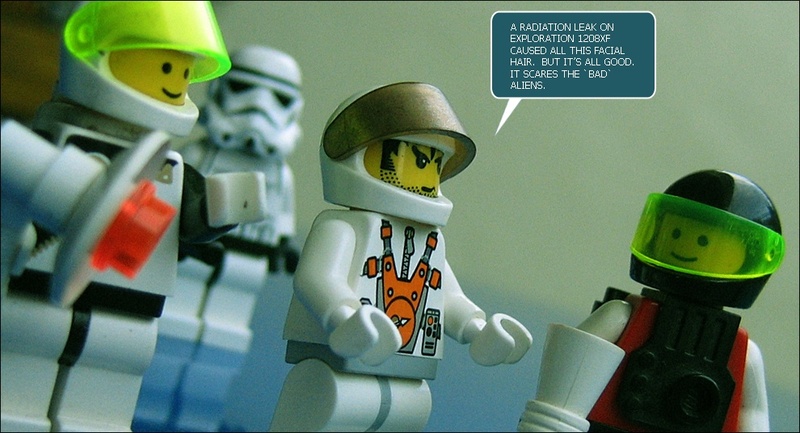 Jimklar, a LEGO SPACE MARS MISSION specialist, on a routine patrol over the Marmalaian Ridge. 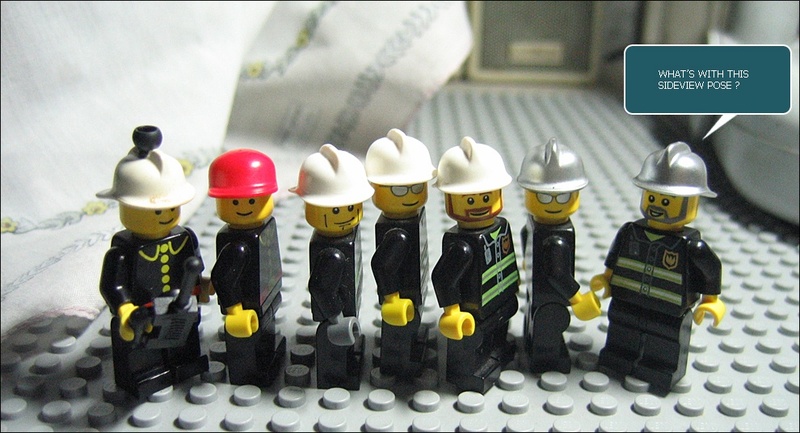 A group of LEGO CITY workers await a bus that will bring them to the photoshoot. Citizens are using government operated buses these days to save on gas. A group of nine stormtroopers on the way to the photoshoot. During the pre-shoot old friends meet each other. LEGO SPACE POLICE Captain Gonard Wilkins here (center) shakes hands with fellow LEGO SPACE POLICE Major Daniel Eskilov, a childhood friend who was assigned to the Franco-Swiss border between the Jura Mountains and the Alps near Geneva, Switzerland. An M-Tron, some Blacktron and Futorons are also included in this picture. Not all are friends though. 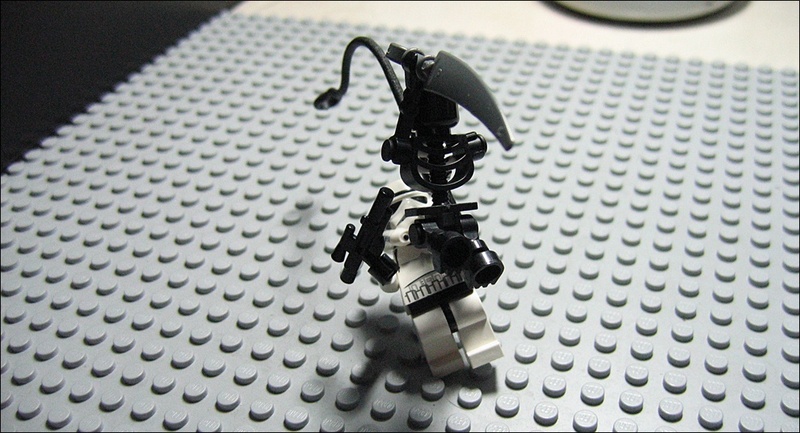 Here a LEGO CASTLE evil skeleton attacks an imperial stormtrooper before the photoshoot started. 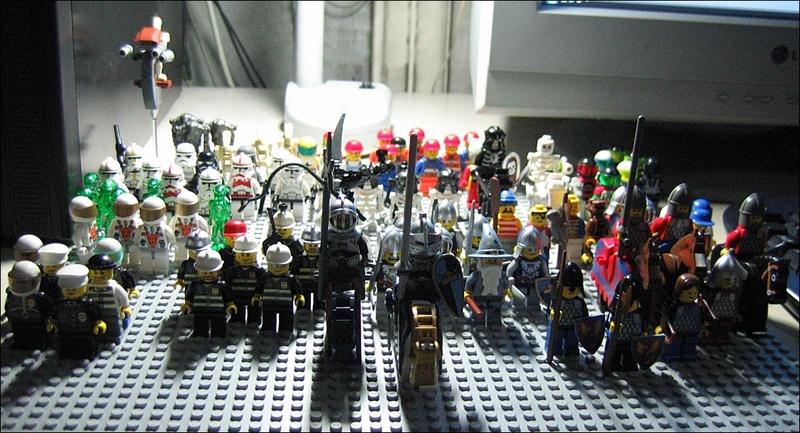 The early batch of LEGO CITY and SPACE minifigs were used as stand ins for test shoots and lighting tests. 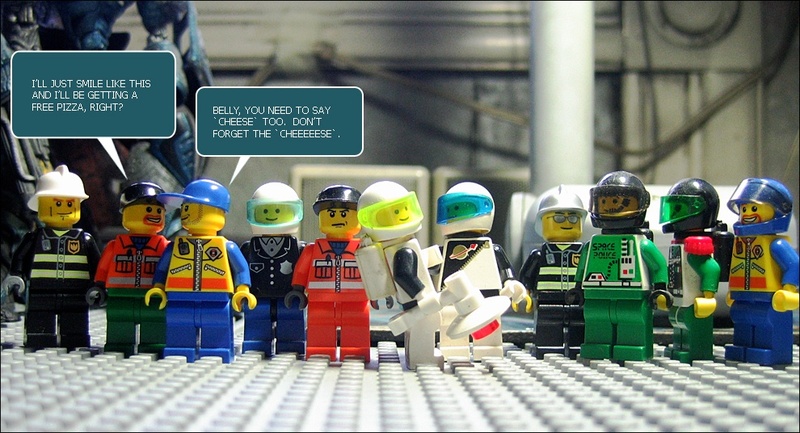 Astronauts of different LEGO SPACE eras unite in this photoshoot. 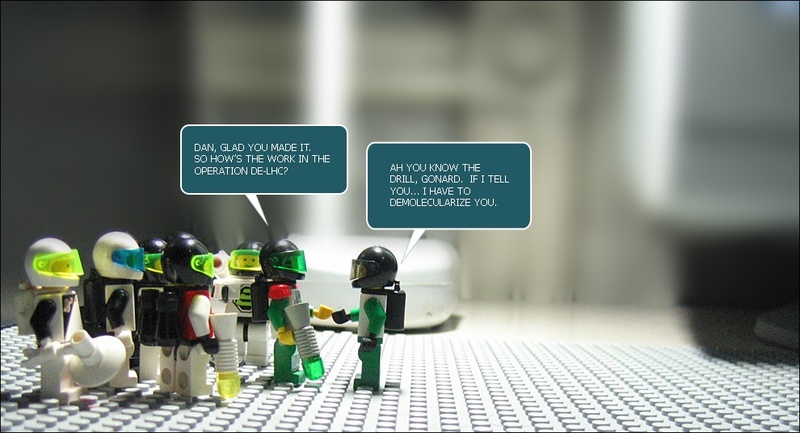 Here LEGO MARS MISSION explorer Subaldo (center), a human space fighter, discusses his recent mission where he engaged in a tactical battle with some unknown alien in the Martian surface to an M-Tron astronaut (right) and a Futuron astronaut (left). An imperial stormtrooper can be seen in the background. 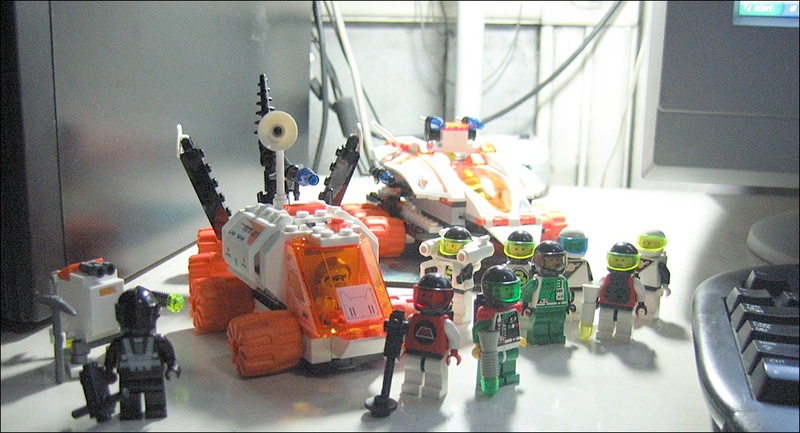 Some astronauts from the LEGO SPACE MARS MISSION era arrived with their astro-vehicles. Jimklar arrives driving his MT-21 Mobile Mining Unit and an MX-41 Switch Fighter can be viewed in the background commandeered by Captain Mico Batumbakal. The MX-41 Switch Fighter can transform between a ground-based vehicle and an agile airborne fighter ready for any tactical mission. The MT-21 Mobile Unit comes with both its drilling platform used to drill for energy crystals and a mobile lab for analysis. 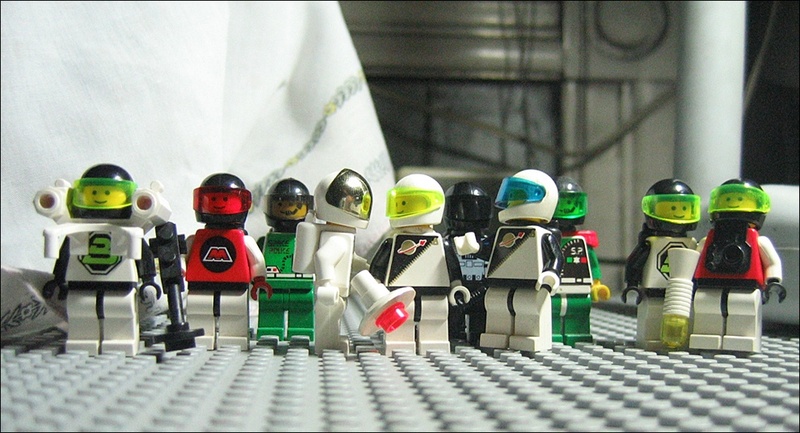 LEGO SPACE minifigs were the first group to have complete members. 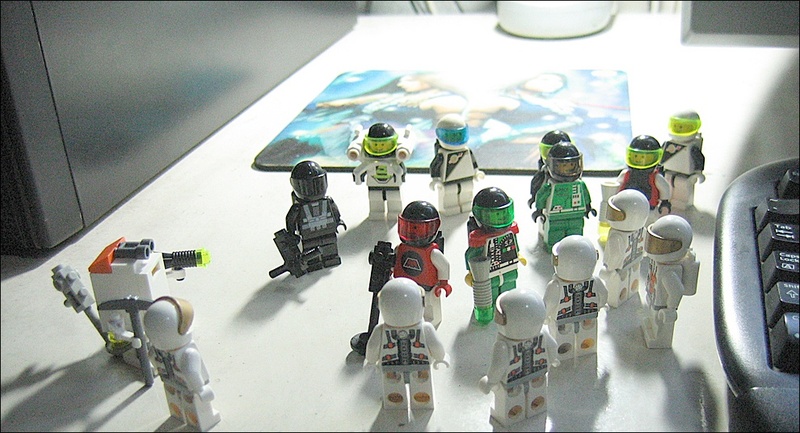 'Older' astronauts greet the new batch of astronauts from the LEGO SPACE MARS MISSION era. 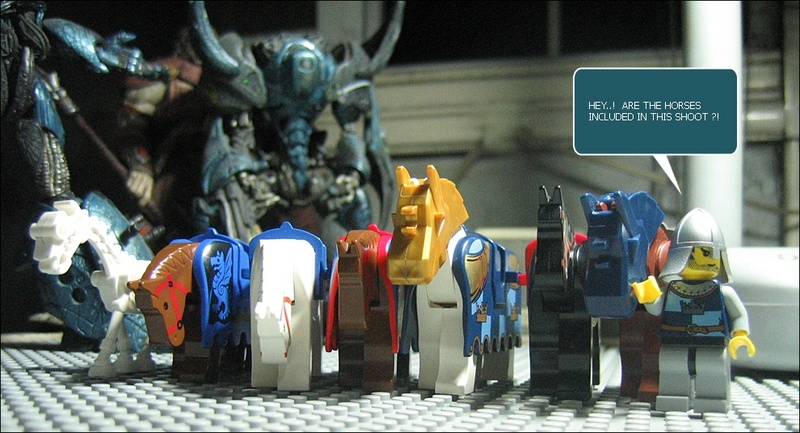 The arrival of different knights' and paladins' horses along with their caretaker, Mistifo. 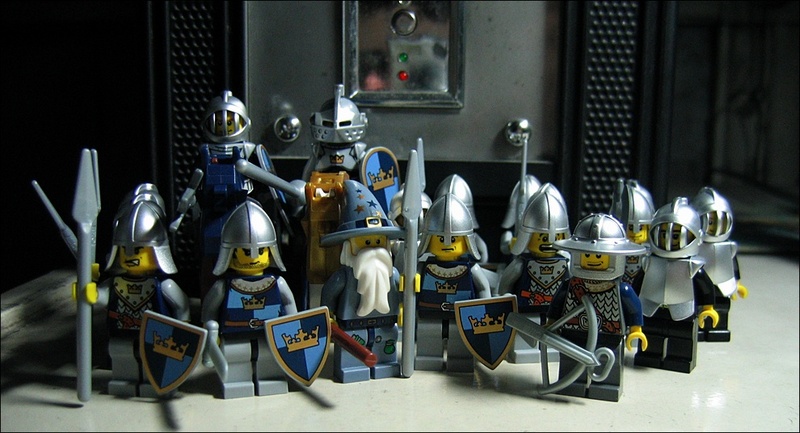 The LEGO CASTLE Knights of the King's Crown along with the Wizard Wilfo. 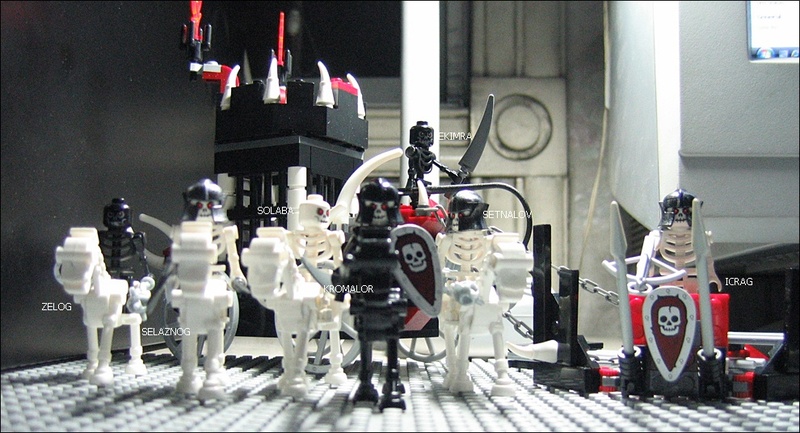 The LEGO CASTLE evil skeletons along with their leader the Black Knight Skeleton (center) clad in an enchanted black armor. 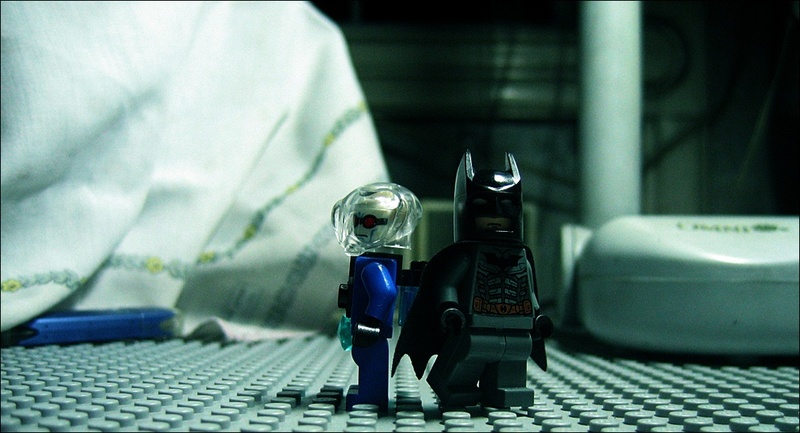 Mr Freeze (left) and Batman (right) agreed not to bite each other's heads off during the photoshoot. Batman wanted a dark ambience while Mr. Freeze insists on an icy cold atmosphere. Our photoshop artists will deal with that later but some set enhancements were installed to make the 'manipulation' easier. 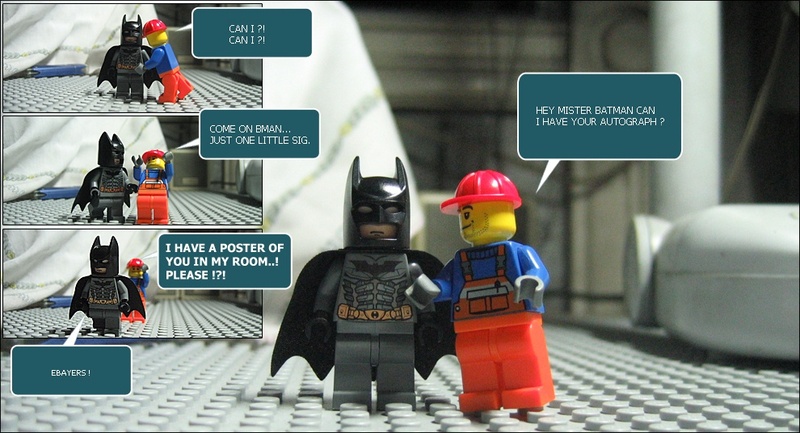 Eric (right) a LEGO CITY CONSTRUCTION and a known comic geek attempts to talk to Batman after that Batman/Mr Freeze shoot. 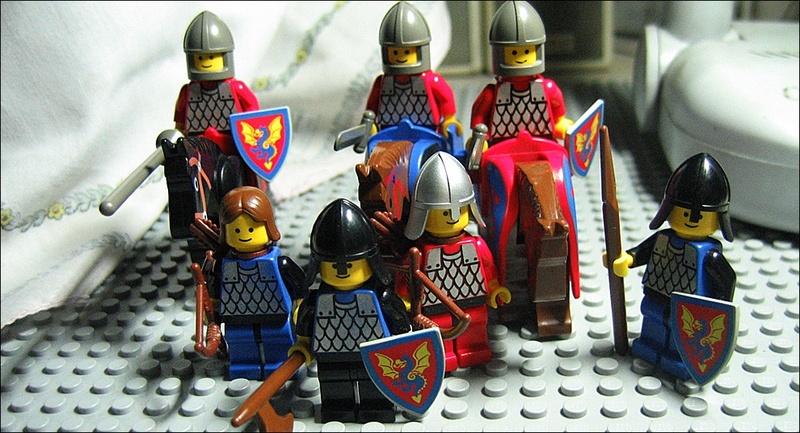 The renegade group of LEGO CASTLE Black Knights with their triangular dragon shields and saddled horses. 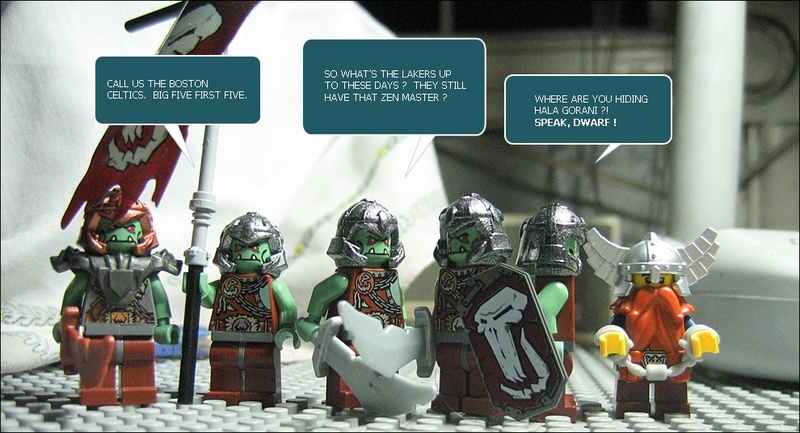 They were previously known as the LEGO CLASSIC CASTLE Dungeon Master's Castle Knights. 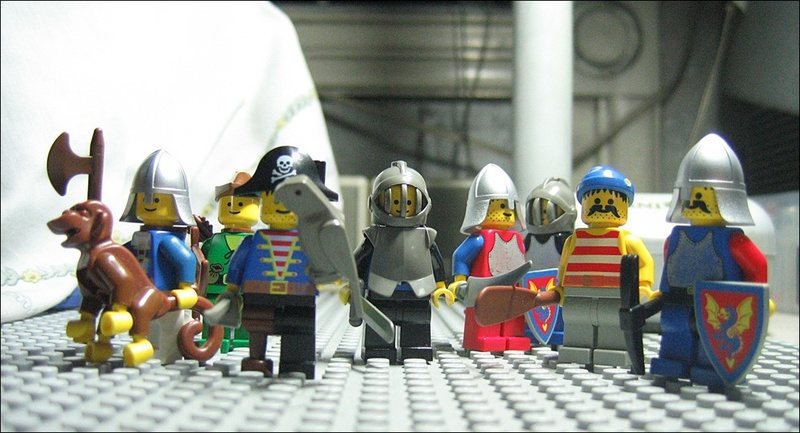 A group of LEGO PIRATES along with some former LEGO CLASSIC CASTLE knights and one forestman was in the shoot. A monkey and a parrot were also present. The parrot here was heard talking about the meaning of life and existence to the pirate head. I think the exact words were 'forty-two forty-two'. 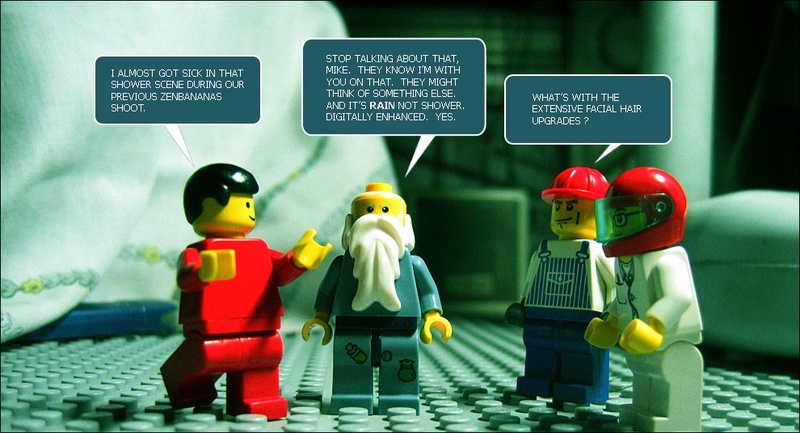 Mike (left in red) and Wilfo (center with beard) were the first 'actors' in that first zenbananas.com photoshoot. 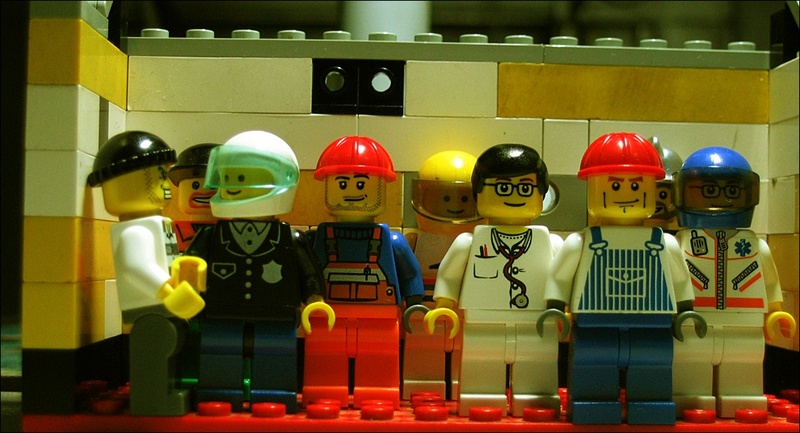 A LEGO CITY CONSTRUCTION worker and a LEGO CITY MEDIC staff are also included in this shot. 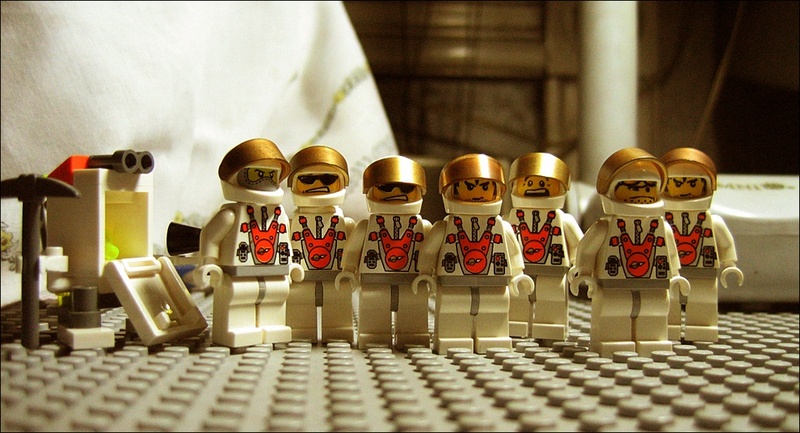 The LEGO SPACE astronauts photoshoot. Three Blacktrons, two M-Trons, two Space Police, one NASA SPACE astronaut and two Futurons are included in this set. 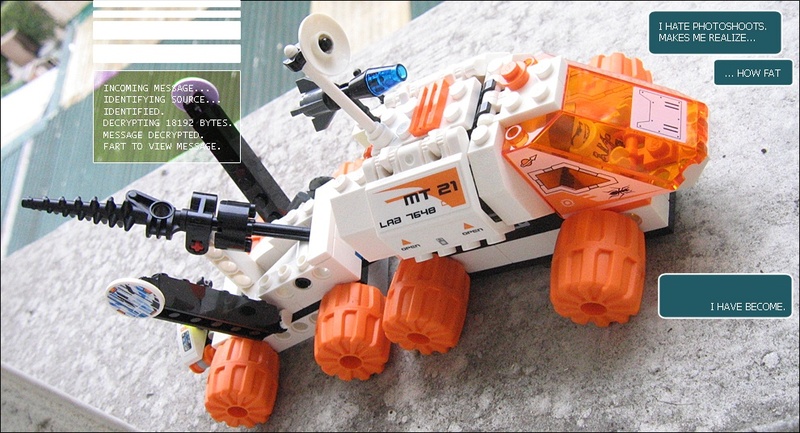 LEGO SPACE MARS MISSION explorers photoshoot along with their mini-mining robot. The STAR WARS photoshoot. 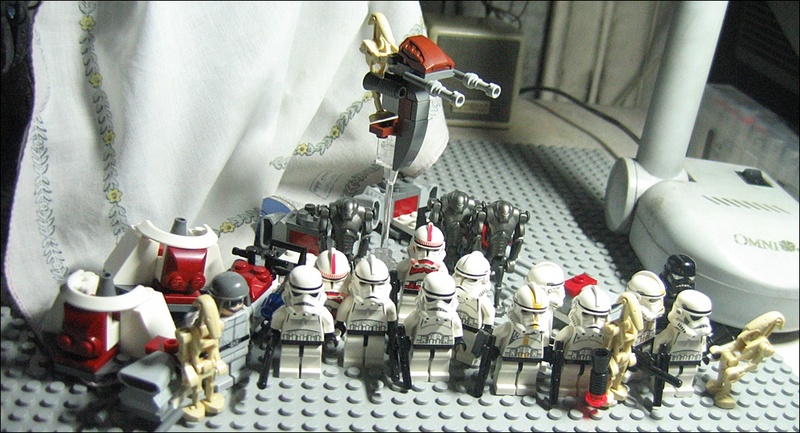 Several stormtroopers, a shadow trooper pilot, a shock trooper, star corps trooper, clone troopers, battle droids and super battle droids and an AT-ST pilot. A droid riding a 'hovering' STAP vehicle is also included in this picture. 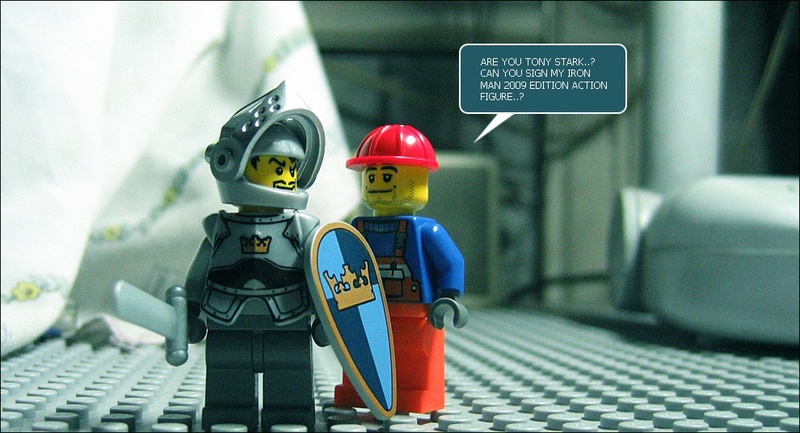 LEGO CASTLE Knights of the Kings's Crown photoshoot. Knights, paladin, catapult operators, archers and the wizard Wilfo is included in this picture. Disorderly and disobedient LEGO CASTLE Troll Warriors surprisingly behaved in this shoot. It was after this session that the set problems occured. A captured dwarf which they refused to unchain was also included. A LEGO CASTLE Troll can be seen guarding the poor dwarf. 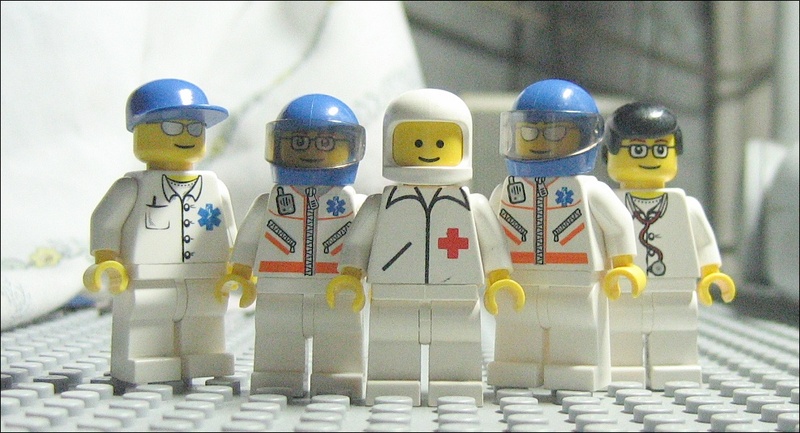 The LEGO CITY medical team. Only one doctor (extreme right) though as the rest of the team are three rescue officers (also co-pilots) and one EMT (Emergency Medical Technician). 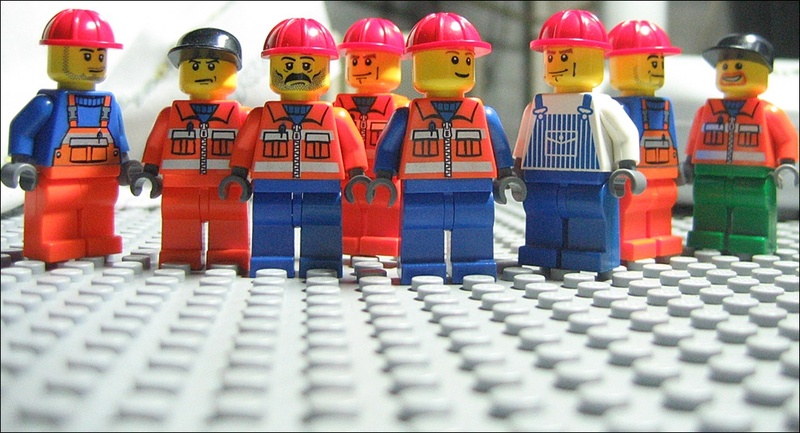 The construction / transport / cleaner LEGO CITY workers photoshoot. 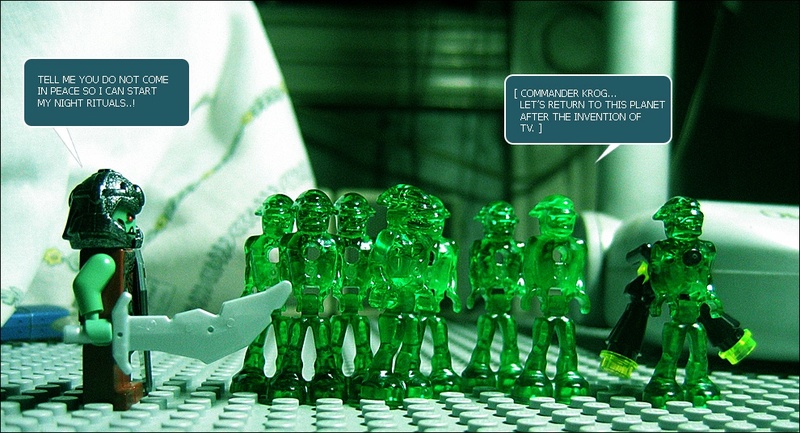 LEGO Mars Mission ALIENS photoshoot. 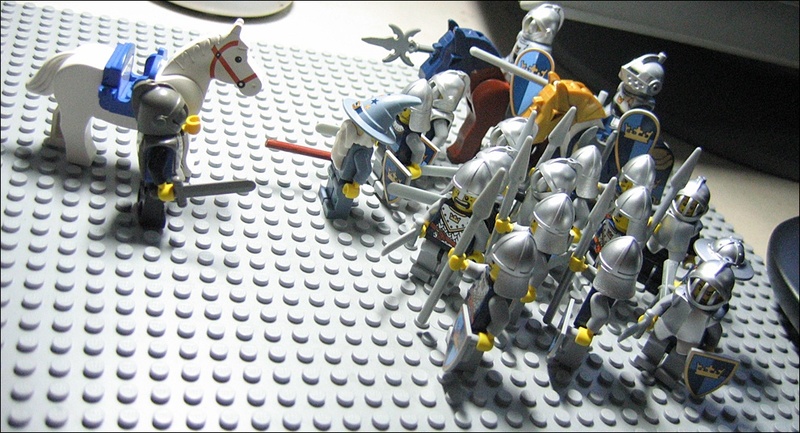 A LEGO CASTLE troll rams into the shoot. One of the several misdemeanors made by the TROLLS in this event. 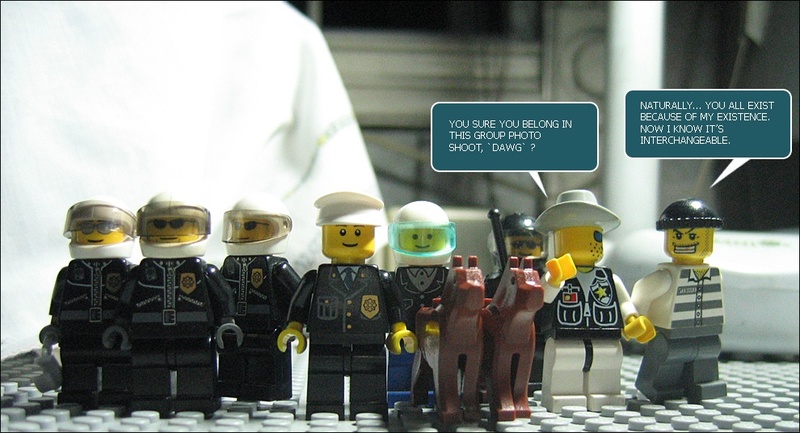 The LEGO CITY POLICE photoshoot with two dogs and one 'dawg' named Freddie. 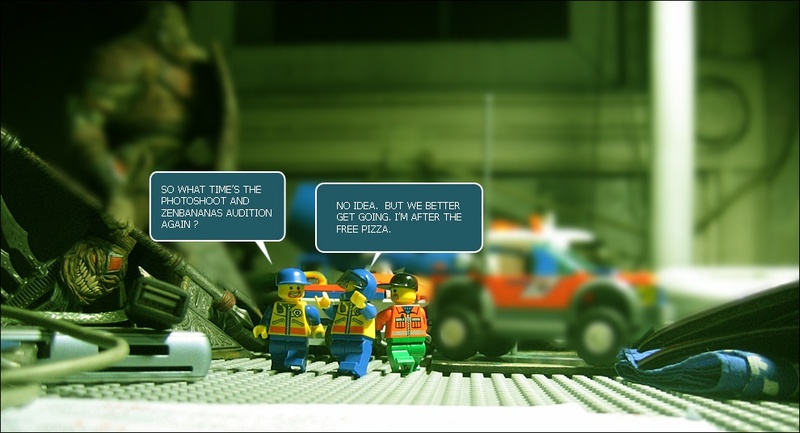 The LEGO CITY FIREMEN photoshoot. The vainest of the group. 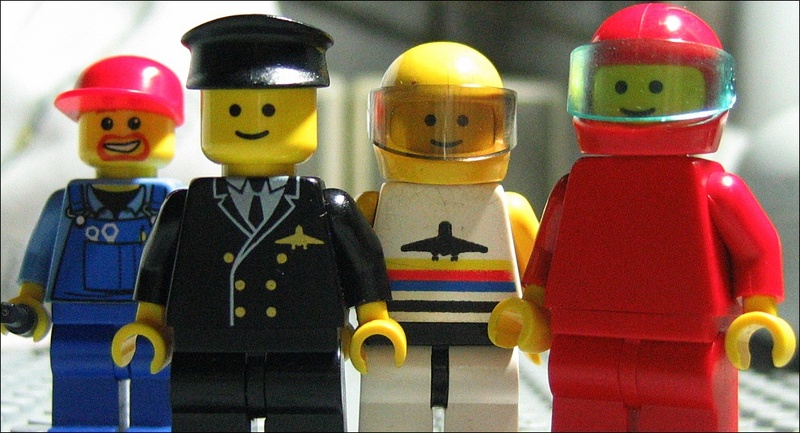 The LEGO CITY AIRPORT crew photoshoot with one pilot, one mechanical engineer and two staff. 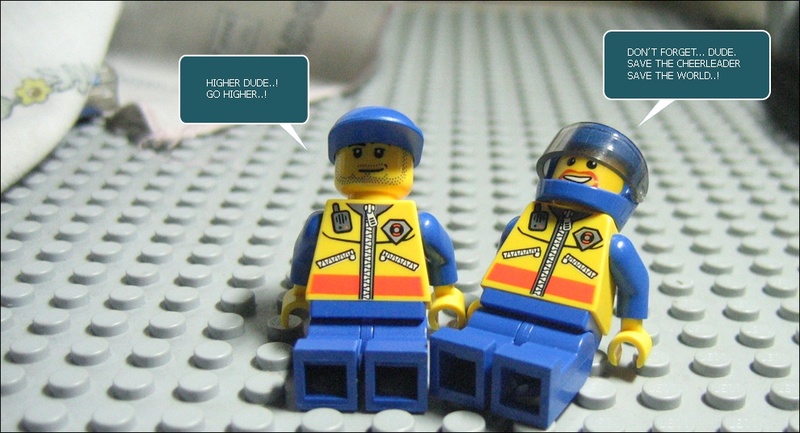 Two LEGO CITY coast guards decided to sit this one out. 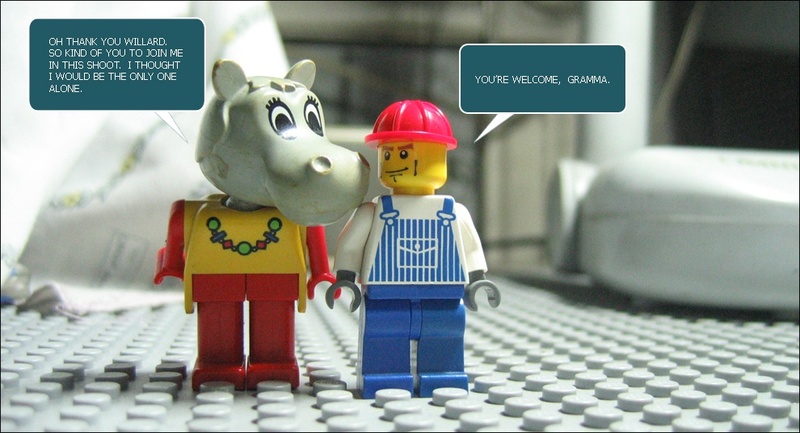 Willard, a LEGO CITY cement mixer driver accompanies 'Gramma' a LEGO DUPLO minifig who has no 'groupmates'. A partial photoshoot which includes minifigs from different clusters. The 'rawrdly' trolls were already kicked out during this time. Eric talking with the LEGO CASTLE Lead General of the Knights of The Kings's Crown. More like pleading.